Manchester United face Barcelona on the road in the second leg of their Champions League quarter-final on Tuesday night. Next Thursday sees Manchester United take on Barcelona in a battle between two of Europe's biggest sides in the Champions League. Man Utd, who have turned around their form since the appointment of Ole Gunnar Solskjaer as their coach, will take on Barca at Old Trafford on Wednesday evening. Philippe Coutinho heading for summer Barcelona exit? Former Liverpool midfielder Philippe Coutinho could pursue a fresh challenge away from Barcelona amid his struggles to cement a regular role during the current campaign. Ex-Liverpool star to reject Manchester United transfer offer? Barcelona midfielder Philippe Coutinho is prepared to reject a potential switch to Manchester United during the ongoing transfer window. Manchester United have reportedly made contact with Barcelona regarding a shock move for midfielder Philippe Coutinho in the current transfer window. Real Madrid and Croatia star Luka Modric has been crowned the Ballon d'Or winner for 2018, thereby ending the decade-long dominance from Cristiano Ronaldo and Lionel Messi. Liverpool could reportedly make an approach to sign long-term target Ousmane Dembele from Barcelona when the transfer window reopens in the New Year. Barcelona and Chelsea have had some exchanges in the recent transfer windows, with the most recent one being that of Pedro who went to London in 2015. Premier League giants Liverpool could reportedly retain their long-term interest in signing Ousmane Dembele, should he part ways with Barcelona. Premier League trio Chelsea, Arsenal and Liverpool have reportedly been placed on high alert with Barcelona said to be considering the option to offload Ousmane Dembele. Barcelona continue to be linked with sealing a reunion with Neymar, and an intriguing offer could be put forth to Paris Saint-Germain, as per reports. Real Madrid boss Julen Lopetegui is likely to pay for the team's poor start to the season, but Spanish media have also heavily criticised the players - and Gareth Bale in particular. 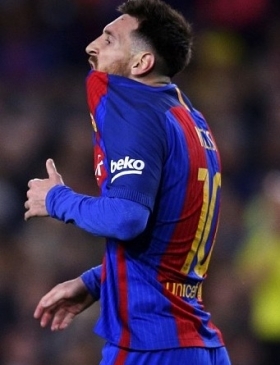 Barcelona superstar Lionel Messi will miss three weeks of action after breaking his arm during a win against Sevilla on Saturday at Camp Nou. Barcelona's search for centre-back has taken them to Italy, and they are planning to raid Napoli. According to Corriere dello Sport (via Sky Sports), Napoli's asking price of £88 million hasn't deterred Barcelona in their pursuit of the Kalidou Koulibaly. Former England coach Fabio Capello has blasted Cristiano Ronaldo and Lionel Messi after the pair failed to attend The Best Fifa Football Awards on Monday. Everton star Jordan Pickford believes Manchester United goalkeeper David de Gea is the best in the business in his position despite an average start to the season. David Beckham has held preliminary talks with Zinedine Zidane over becoming the head coach of his new team Inter Miami FC in 2020. Eric Abidal continues to scour Ligue 1 in the hope of finding talented prospects for bargain prices.